In the UK goats are kept for their milk, meat, hair (mohair/cashmere) and hide. Goats naturally live for 10-12 years, and like to browse and cover a wide range for their food and grazing. Their coats are made from hair which does not have natural waterproofing, so shelter is a requirement in wet weather. A goat under six months old is called a ‘kid’. Female kids become sexually mature at around six months and are usually bred at 18 months. The productive life of a dairy/fiber goat is seven years. Goats endure mutilations such as disbudding and dehorning. 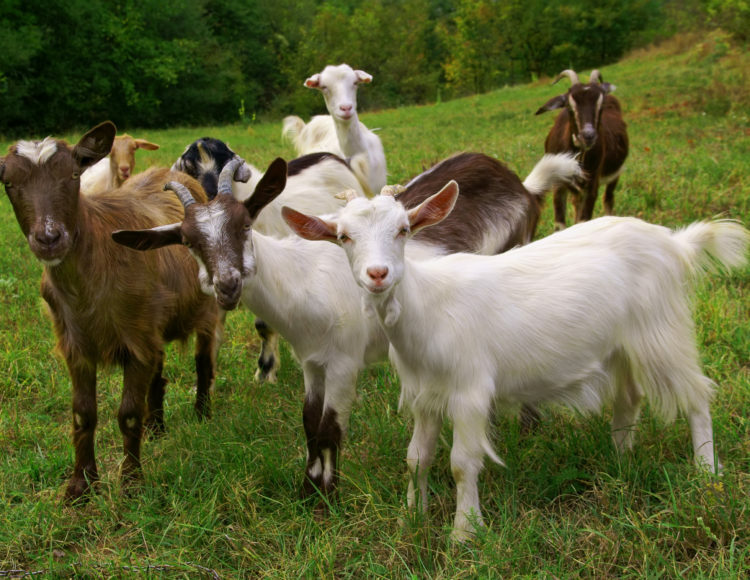 60% of goats are kept in small herds for milk production. British Saanen goats produce high milk yields and are most commonly used commercially. About 75% of British goat milk is used in cheese production. Most goats have two coats, a coarse hairy outer/guard coat and a soft undercoat (cashmere). The Angora goat has a single coat (mohair) which is coarser than cashmere but produced in larger quantities. Cashmere is harvested by either shearing or combing, whereas mohair is harvested by shearing. Goats suffer from diseases such as scrapie, Johnes’ disease, Caprine Arthritis Encephalitis Virus (CAEV), foot and mouth disease and mastitis in milking goats. Male kids, surplus to the dairy herd, are slaughtered at 12 weeks old for meat. Breeding goats are usually slaughtered after six years. Unless destined for religious/ritual slaughter, goats are stunned before having the blood vessels in their throats cut (sticking).